Luxury Experience Magazine got to know Chef Hans Nussbaumer of the Rôtisserie des Chevaliers (14 points GaultMillau) at the Kulm Hotel St. Moritz in Switzerland during our stay at the hotel during the St. Moritz Gourmet Festival. 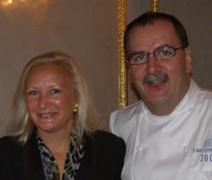 This generous chef not only shared his recipes, he also shared his kitchen with Guest Chef Emmanuel Renaut of France. Chef Hans Nussbaumer honed his impressive culinary career around the world before joining the grande dame Kulm Hotel St. Moritz 15 years ago, where he now oversees 3 of the hotel's restaurants. If I had to describe Chef Nussbaumer in one word, I would say, happy, as whenever I saw him, which was often during the six-day festival, he always had a smile on his face, and a twinkle in his eye, as all things culinary are clearly his passion. The Kulm Hotel St. Moritz was built in 1856, and when I took a tour of the kitchen with him, I must say that I was rather surprised, but the kitchen still has the original stove! From this treasured piece of equipment, come forth Chef Nussbaumer's delectable traditional French creations. When not working at the stove, he enjoys traveling for culinary inspiration, hiking, music, and spending time with friends. He generously shares his recipes for a tasty 3-course menu. Method: Temper the eggs in warm cream in a bowl. Add the tomato coulis and the rest of the ingredients in the bowl. Put into small chafing dishes and cook in a Bain-Marie for 30-40 minutes. The Tomato Crème Brûlée can be served as a starter together with San Daniele ham, smoked duck breast, or grilled Mediterranean vegetables as a vegetarian option. Method: Mix all ingredients together in a bowl until you have a smooth consistency. Put the mixture in a piping bag. Dust a baking tray with flour, and then pipe the mixture onto the tray about 2.5 cm (0.7 - 1.1 inch). Poach the gnocchi in boiling salted water for a very short time, 2-3 minutes. Serve the gnocchi with any of the following: morels or boletus sauce (mushrooms), pesto (basil, garlic, pine nuts, olive oil), tomato sauce, or seafood sauce. Method: Melt the butter and sweat the onions (do not let them color). Add the marrow and the Pinot Noir and reduce the liquid by half. Mix with a hand blender to purée. Season the fillets, and then poach them gently in a demi glace and Pinot Noir for about 8 minutes. Remove the fillets, and keep warm. Reduce the sauce by half. Add the marrow purée, whisking it in slowly. Presentation: Ladle sauce on the plate, place the filet and garnish with the poached marrow on top, freshly ground black pepper and chives. Read other articles on the Kulm Hotel St. Moritz and St. Moritz in the Destinations, Hotels and Resorts, Restaurants, Spas, Gastronomy, and Adventures sections.